Travelers often ask me, “Carl, I’m going to Tahiti. What should I wear?” And my reply is to dress casual and comfortable. And, well, if you would really like to look like you live there – the answer is to wear a Pareo. Colorful, lightweight, comfortable and hand painted, the “Pareo,” also known as a Pareu, is an essential part of Polynesian life. 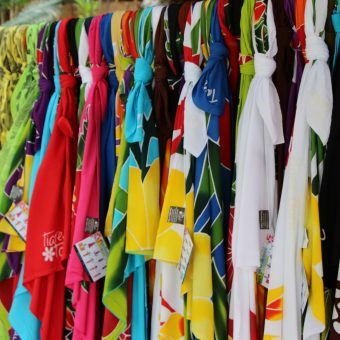 Elsewhere in the South Pacific, you may hear them referred to as a “Sulu,” “Lavalava,” “Sarong” or a “Tupeno.” Pareo’s remain unique as they reflect the living and breathing life that is unique to Tahiti. While mainly worn by women, it is not uncommon to see them on men too. Pareos are about two square meters in size and traditionally made from light cotton. These days, polyester and rayon have been added to the mix. Silk is rare but available and more expensive. You’ll note that I mentioned that these are traditionally hand painted. Natural and man-made dyes are used. The tints, diluted with water are artfully applied to the cloth. Following this process, they are laid out to dry in the Tahitian sun. Bright colors depicting fauna and island life are often the choice of the Pareo artisans, but designs are really limited only by the Polynesian inspired imagination. Markets and artisian sh ops throughout the Tahitian islands offer a wide selection of Pareos. The price will be highly dependent upon whether you are drawn to a cotton/polyester mix, the luxurious silk and the time and effort put into the design by creator. Of course, like everything in our world today a less expensive mass produced versions are available as well. The most memorable souvenir is to find a local roadside artist hand painting pareos and see the process in action and support the artist. 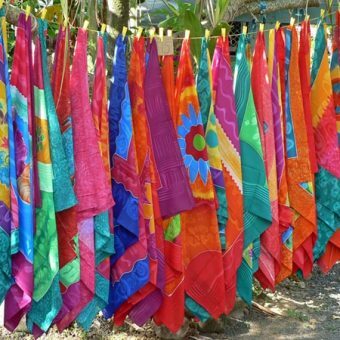 Choose to wear it or even hang it on a wall as a colourful reminder of your time in the islands. When I fashion your holiday to the islands, let me know of your interest in Pareos. I’ll make sure that I include a tour of the markets, a self drive tour, or an island excursion that has stops at Pareo shops for you. 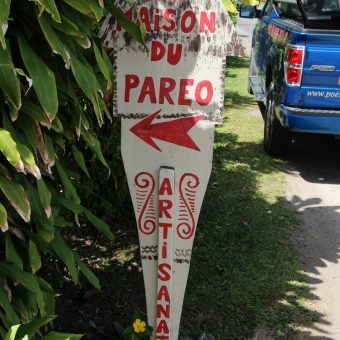 This entry was posted in Tahiti Experiences, Culture. Bookmark the permalink. What? They Are Not the Same?